The Australian Navy has celebrated the launch and formal naming of the third and final Air Warfare Destroyer, HMAS Sydney. Sydney has now joined the second AWD, HMAS Brisbane, alongside the wharf at the Osborne Naval Shipyard in South Australia, with the latest vessel marking a 60 per cent productivity improvement from the first ship to the third ship since the implementation of the government-led reform initiative. The program was once plagued with problems, delays and cost blowouts in its earlier years but was recently removed from the Department of Defence's projects of concern list. 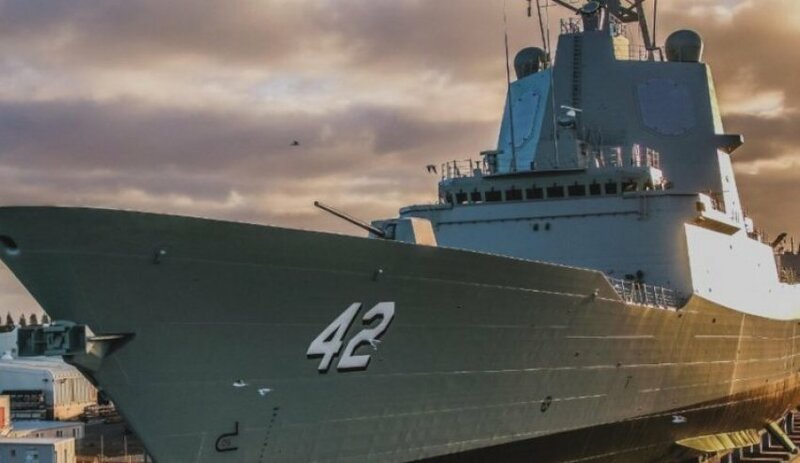 Minister for Defence Industry Christopher Pyne said the achievement shows the strength of the shipbuilding and systems integration skills that have been developed by the AWD Program. "It’s difficult to imagine just 10 years ago, this shipyard at Osborne was a brownfield site with no infrastructure," Minister Pyne said. "Since then, more than 5,000 people have worked directly on the AWD program to build and integrate three of the most capable and potent warships the Navy has ever possessed. "This is underpinned by the 1,500 suppliers who have supported the AWD Alliance in its efforts to exceed Australian industry capability targets for the overall program." The AWD Alliance is now on track to deliver the second ship Brisbane to the Commonwealth in the coming months, followed by the delivery of Sydney next year. ASC Shipbuilding acting CEO Jim Cuthill said the launch of Sydney represents the capability of Australia’s shipbuilding industry in building highly capable and complex warships for the Royal Australian Navy. "The launch of the third destroyer Sydney marks a decade of hard work, commitment and collaboration by ASC Shipbuilding and its AWD Alliance partners," he said. "With the building of each ship, the ASC Shipbuilding workforce has demonstrated continuous improvement and innovation – I congratulate the workforce on building this impressive warship, and the two that came before it." AWD program manager Commodore Craig Bourke congratulated the workforce on achieving this significant milestone. "Over the past 10 years, we have seen more than 5,000 people and 1,500 suppliers contribute millions of hours of effort to the AWD program – the most complex defence project ever undertaken in Australia," he said. "The complexity of this project is reflected in the sophistication of the AWDs – these warships will provide a true step-change in capability for the Australian Defence Force. As the most potent warships Australia has ever possessed, all three destroyers feature an advanced anti-submarine warfare capability, state-of-the-art radar technology and an air defence system capable of engaging enemy aircraft and missiles at an extended range." AWD Alliance general manager Paul Evans also acknowledged the complexity of the AWD program and emphasised the cooperative role required between industry and Defence to deliver this capability. "The AWD program is a further demonstration of the important role that industry plays as a fundamental input into capability for Defence. This sovereign shipbuilding and combat systems integration industry that has been built through the AWD program has helped us exceed our Australian industry capability targets by almost 20 per cent," said Evans. "Together, the AWD Alliance has worked to transform a brownfield site into a functioning shipyard that has continued to improve processes, skills and efficiency. This is a credit to the 1,600 highly-skilled people still actively working on the AWD program today – from pipefitters and welders to program managers, systems integrators, procurement officers and administrators." Raytheon Australia managing director Michael Ward welcomed the launch of Sydney and commented on the sovereign combat systems integration capability that the company has built over the past decade through the AWD program. "Raytheon Australia has worked closely with the Commonwealth to architect, design, test and integrate Australia’s most advanced and complex combat system on time and on budget. The AWD combat system integration activities represent some of the most advanced and complex engineering and project management skills in this country," Ward said. "Today’s milestone is a credit to the AWD workforce and is a reflection of our long-term investment to build a local combat system integration capability. The success of the combat system integration activity is a source of tremendous pride for Raytheon Australia. Not only have we performed admirably on this project but we have built for Australia a national asset in combat system integration." Navantia Australia chairman Warren King said Sydney and her sister ships represent the capability of the Australian defence industry. "Navantia Australia is very proud of our role as ship designer of these state-of-the-art warships and as shipbuilding management services provider for the AWD Alliance," said King. "The launch of Sydney, the third of her class today, is a significant milestone for us as the AWD program signalled the beginning of Navantia’s relationship with the Royal Australian Navy and Australian industry. Since entering service in late 2017, HMAS Hobart has continually established herself as the Royal Australian Navy’s most capable and advanced warship. "The Hobart Class destroyers not only deliver revolutionary air defence capabilities against advanced aircraft and cruise missile threats, but these formidable warships are also providing the Navy with unsurpassed anti-submarine warfare capabilities. Sydney, together with her sister ships, HMAS Hobart and Brisbane, are true examples of Australian defence industry capability – designed for Australia and built by Australians."